History: Although Voyager has 25 races under his belt, racing wasn’t for him. 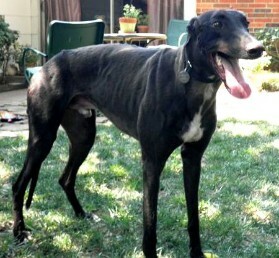 He is ready for retirement and would much rather sleep on a soft bed at home with his Greyhound buddies. He’s a very affectionate and friendly boy. Voyager is used to a crate and doesn’t mind snoozing there while his person is away from home. 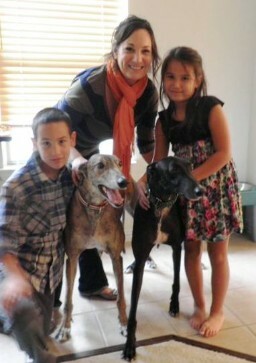 Grayson, Gina and Anna with Rusty and Voyager! 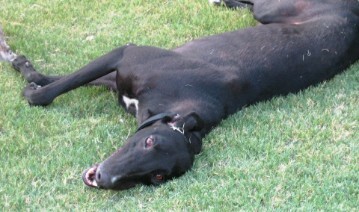 October 2, 2011 update: Adopted! 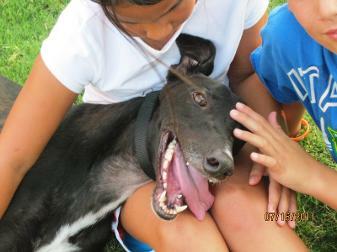 Congrats to his foster family! July 26, 2011 update: During his time with his foster family, Voyager has melted our hearts and kept smiles on our faces, with his playful energetic puppy spirit and his ability to make you laugh no matter what the day has brought. 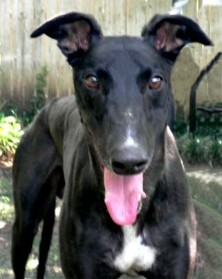 He has definitely come a long way, but more importantly, become an essential part of what a family needs in a companion. Voyager is very obedient and especially loves meal time and an occasional snack here and there. He loves fruit and veggies and probably anything else that tastes halfway decent, but he especially enjoys a little yogurt to accompany his meal; runners have to maintain a balanced diet! We are currently working on his manners and the basics, but overall he is a real treat to have in our home. He is always very excited to see you after a long day away, even though he's been in his crate, and is very good about letting you know he has to use the "little dogs room"(the backyard). Voyager is very good with kids and has a lot of patience and restraint. Our 6 and 8 year old children love on him like he is small enough to carry around, and he truly is just a big teddy bear. He can find a soft spot to lay just about any where and he doesn't mind if you decide you want to snuggle up on next to him. Voyager is your typical dog... he loves his squeeky toys!!! He will "squeek" away as long as you let him and he will even play tug-a-war and fetch with his toys. Voyager also plays well with friends. 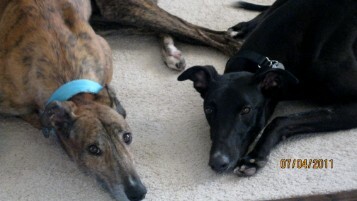 Our 5 year old Greyhound, Rusty, has absolutely loved his company and they play very well together. We have also small dog tested him and he does just fine... don't think Voyager will ever meet a dog he doesn't like! Overall, Voyager is an extremely laid back, fun-loving friend who wants so badly to have a permanent home where he is loved and adored. He is the perfect fit for a family with younger kids or even a family with an "on the go" lifestyle. As long as he is fed, petted and given an occasional bath... he is on top of the world and will make you feel the same with his loyalty and love.